A Hamilton County judge is denying a temporary restraining order to stop demolition work on the former Dennison Hotel on Main Street in Downtown. Judge Lisa Allen issued her decision after a 45-minute hearing Tuesday. Cincinnati's Historic Conservation board has decided the current owners of the former Dennison Hotel cannot tear it down. The board voted 3-2 Thursday to deny a certificate of appropriateness to demolish the building. Cincinnati's Historic Conservation Board has continued a hearing on whether the former Dennison Hotel on Main Street in Downtown can be demolished. A vote will come at another hearing, which has not been scheduled. 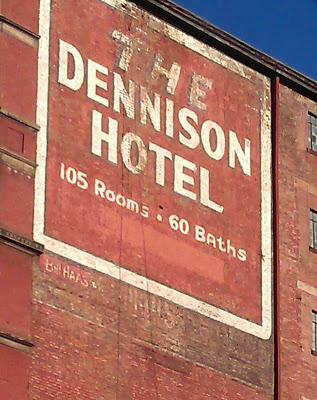 Cincinnati staffers are recommending the city's Historic Conservation Board reject an application to tear down the former Dennison Hotel on Main Street in Downtown.